Hillsboro (Hillsborough) County, on N.H. 31 near its junction with N.H. 9, about 3 miles west of Hillsboro (Hillsborough). This was the boyhood home and possibly the birthplace of Franklin Pierce. About the time of his birth in 1804, his father, Benjamin, built it and relocated his family there from a nearby log cabin. In addition to farming and participation in local politics, Benjamin operated a tavern in the structure, which became the social center of Hillsboro. He also trained county militia in the upstairs ballroom. During the years 1820-27, Franklin was often away from home, attending Bowdoin College, in Brunswick, Maine, and then studying law in Portsmouth, N.H., Northampton, Mass., and Amherst, N.H. In 1827, the year he returned home and established a law practice in a shed across the road from the homestead, his father became Governor of New Hampshire. Not long afterward, Franklin himself sought public office. In 1829 he entered the legislature, and 4 years later won election to the U.S. House of Representatives. 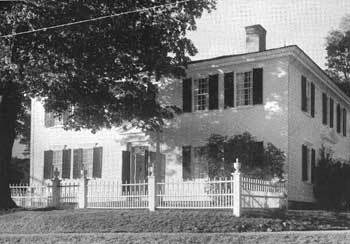 About the time of his marriage in 1834 he purchased his own home in Hillsboro; 4 years later he moved to Concord, N.H. The homestead remained in the Pierce family until 1925, at which time the State acquired it. Between 1945 and 1950, the New Hampshire Federation of Women's Clubs restored it. A handsome example of New Hampshire village architecture, it is a two-story frame structure that contains eight rooms. The roof is hipped. Furnishings include a few period pieces. The most outstanding room is the parlor, highlighted by mahogany furniture covered in horsehair cloth, a Brussels carpet, and French wallpaper decorated with scenes of Naples Bay. Stencilled decorations adorn the walls of other rooms. In the upstairs ballroom, which extends the length of the house, is a curved table that the State legislature used when Pierce held the speakership. A restored barn at the rear of the residence is connected to a kitchen and service ell that was added at a later date. The house is surrounded by fields and woodlands. It is owned and administered by the State.